Rollerblade Macroblade 84 Alu Men - equipped in 2016 with 4 x 84mm wheels, a hardness of 84a, and an SG-7 bearings. The skates were re-equipped with 3x lacing. With ratchet strap, Velcro, and a normal lacing. The convenient and easy skating 84 mm inline skate of Rollerblade in 2016. The frame is depending on the size of skates, a foot length of 22.0 cm to 28.0 cm with a 26.5 cm long frame. and with 29.0 cm to 31.5 cm foot length with a 28.0 cm long frame. The perfect fitness skate for Inline Skate beginners and spare time skaters. The new 84 mm free time inline skates by Rollerblade, with 265 mm frame at 22.0 cm - 28 cm foot length and 280 mm frame length at 29.0 cm - 31.5 cm foot length. The 4x 84 mm wheels were fitted with SG-7 bearings. The inner boot - a 5 Star Foam Liner provide with comfortable sole guide the feeling of comfort. 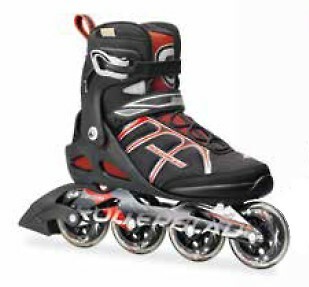 With a 45° Velcro, ratchet strap, and a normal lacing You can lace up the fitness skate of Rollerblade very easy.